Posted on November 27, 2018. Filed under Association News. Be the first to comment. 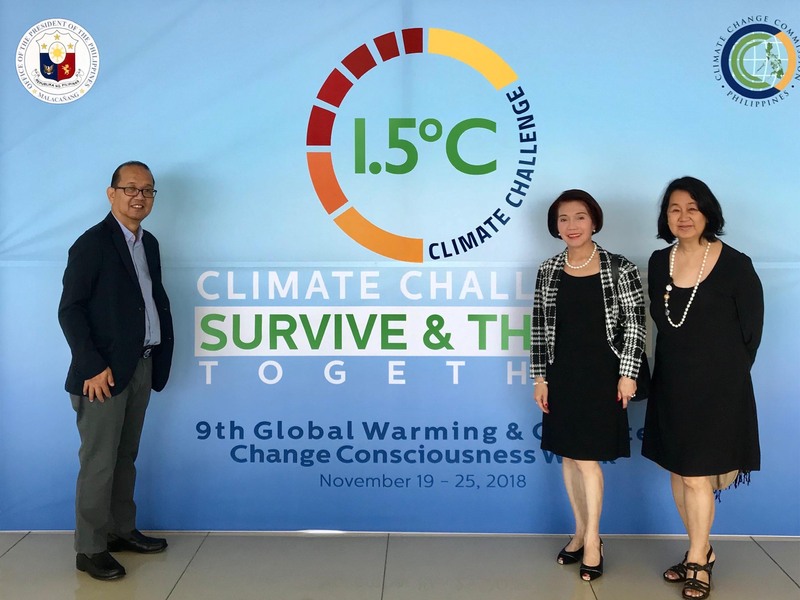 ADFIAP participated in the opening ceremonies of the “Global Warming and Climate Change Consciousness Week” held on November 19, 2018 at the SMX Convention Center, Mall of Asia, Pasay City, Philippines. In accordance with Proclamation No. 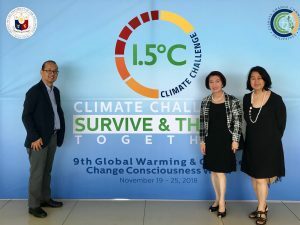 1667, s. 2008, the Climate Change Commission (CCC) leads this year’s observance of the “Global Warming and Climate Change Consciousness Week” from November 19-25, 2018 with the theme “The 1.5 Celsius Climate Challenge: Survive and Thrive Together”. The theme drives the message that sustainability of businesses and survival of the planet is anchored on keeping a global temperature rise this century well below 2 degrees Celsius above pre-industrial levels and to pursue efforts to limit the temperature increase even further to 1.5 degrees Celsius. The event highlights the whole-of-government climate actions together with sustainable development stakeholders and the country’s vision and policy directions towards a green economy and low-carbon future, informed by the latest climate science, technology, knowledge and best practices on adaptation and mitigation. Climate action leaders in business and the banking industry and advocates of the country’s pursuit of low-carbon transition and societal transformation attended the opening ceremonies which kicks-off the week’s thematic forums that address critical policy issues and challenges we all have to respond to if we have to survive and thrive in the era of climate change. Secretary Emmanuel M. de Guzman, Vice-Chairperson and Executive Director of CCC gave the opening remarks which focused on CCC’s achievements and current initiatives. Topics taken up during the event included the Special Report of the Intergovernmental Panel on Climate Change on the Global Warming of 1.5 Degrees Celsius by Dr. Rose T. Perez; Linking Science, Policy and Climate Action by DOST Secretary Fortunato de la Pena; The Philippine Climate Change Outlook by Fr. Daniel J. McNamara, S.J. ; Advancing Climate Change Education in the Philippines by DepEd Secretary Leonor M. Briones; The Climate Policy Landscape in the Philippines by various speakers led by CCC Commissioner Rachel Herrera; Rising to the 1.5 Celsius Climate Challenge: Leadership Resolve and Commitment to Climate Action by the business and banking sectors; Aligning National and Local Development Plans to the 1.5 Celsius Global Climate Goal and the Sustainable Development Goals by NEDA Secretary Ernesto Pernia; A Vision for a Climate-Resilient Philippines by President Rodrigo Duterte. ADFIAP, which was represented in event by ADFIAP Consulting’s Corazon D. Conde, Carmelita M. Chavez, and Victor C. Abainza, is a partner of CCC in its climate finance advocacy and initiatives under the UN-ESCAP programme.